I got Pom Cider while I was in stores because the sales associate at the DavidsTea store talked a lot about how great and fantastic it is. They didn’t have it as a sample/Tea of the Day that day, so I wasn’t able to sample it before going home with a little bit of it just to try. I first smelled the dry tea in store, but smelling it again at home made me question why I got it. It smells very sweet, and is reminiscent of cherry-flavoured cough syrup – definitely something that I did not enjoy as a child whenever I was sick and I do not enjoy it now. Pom Cider is made up of: fennel, hibiscus, black tea, rosehips, apple, orange, pomegranate, stevia extract, and natural pomegranate flavouring. You can definitely see the fennel. 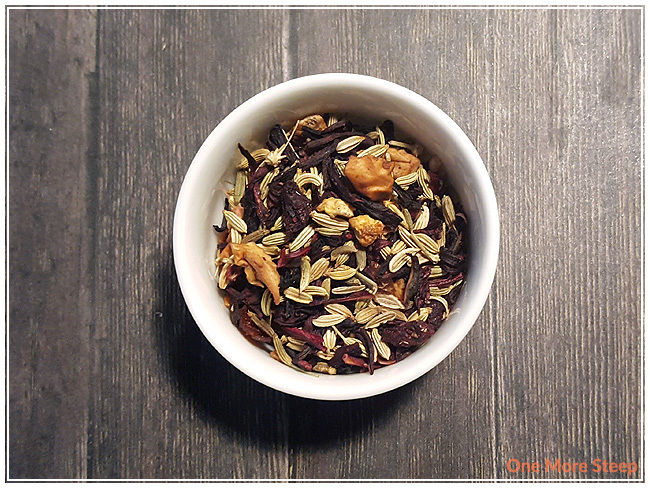 There is just so much fennel involved with this tea that the black tea takes a back seat compared to the rest of the ingredients. 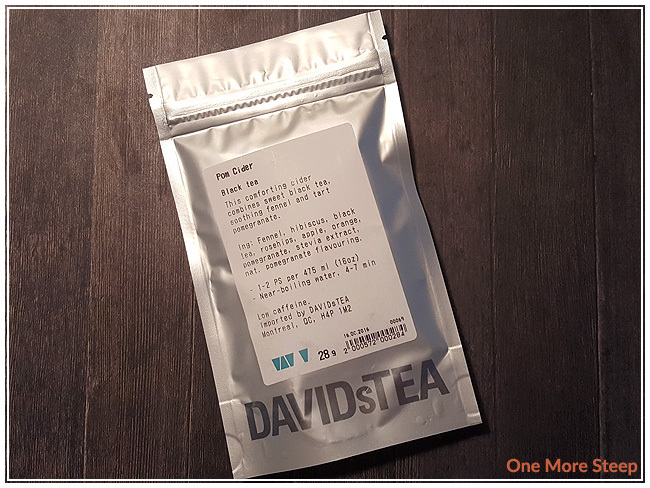 DavidsTea recommends steeping in near-boiling water for 4 to 7 minutes. Near-boiling, according to the product page, is 90-95°C (194-203°F). Pom Cider steeps to a beautiful deep red that I would guess is contributed to by the rosehips, hibiscus, and pomegranate (but mostly the hibiscus). The tea itself smells very strongly of rose and hibiscus, but I don’t smell any of the pomegranate which is disappointing. 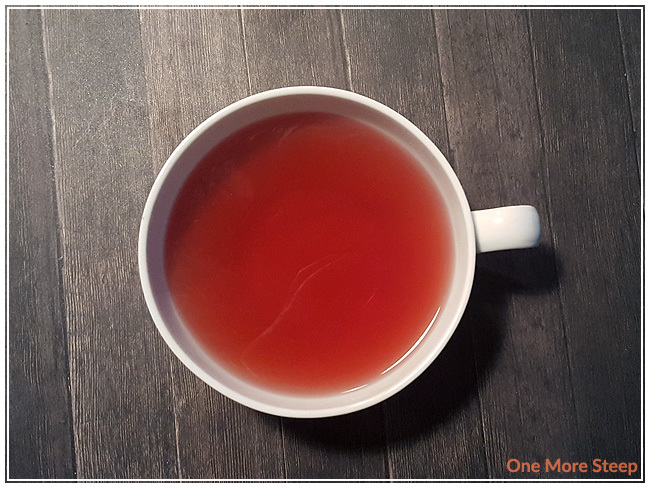 The tea itself tastes very sweet and tart, it has an odd after taste that I find happens a lot with teas that come with artificial sweeteners mixed in already. Pom Cider tastes more of all the other ingredients than it does the black tea base, which is a bit disappointing. I feel that if the additives highlighted the black tea, it would be more enjoyable. The tartness in the taste creates a lot of mouth pucker feel that reminds me the natural tartness that apple cider can have, but it doesn’t have the same spice profile that apple cider has. The lack of pomegranate in the flavour of Pom Cider is really disappointing. I did not attempt one more steep of Pom Cider. 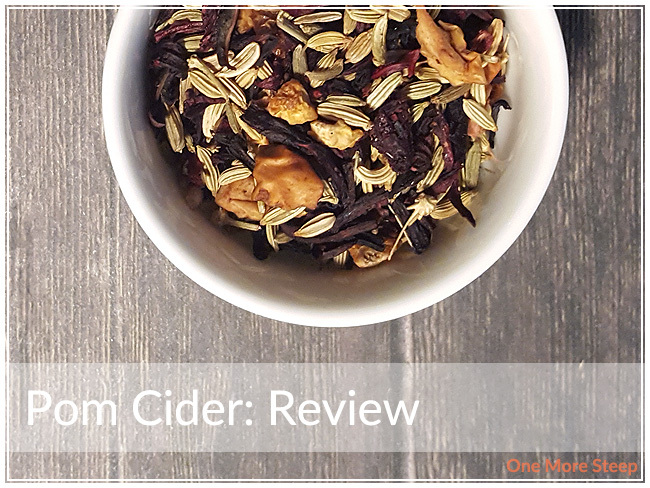 I didn’t like DavidsTea’s Pom Cider. I’m not sure what I was thinking when I bought a small bag of this tea, the fact that it smells like cherry cough syrup is off-putting and it doesn’t make me want to try it after I got a good whiff of the tea. But I tried it anyways, and I was really disappointed by the lack of pomegranate flavour in the tea itself, as well as the overall sweetness of the tea (and the weird aftertaste that artificial sweetener lends to the tea itself). I wish that the black tea was more in the forefront of the tea’s flavour profile instead of being the understudy to all the other ingredients.